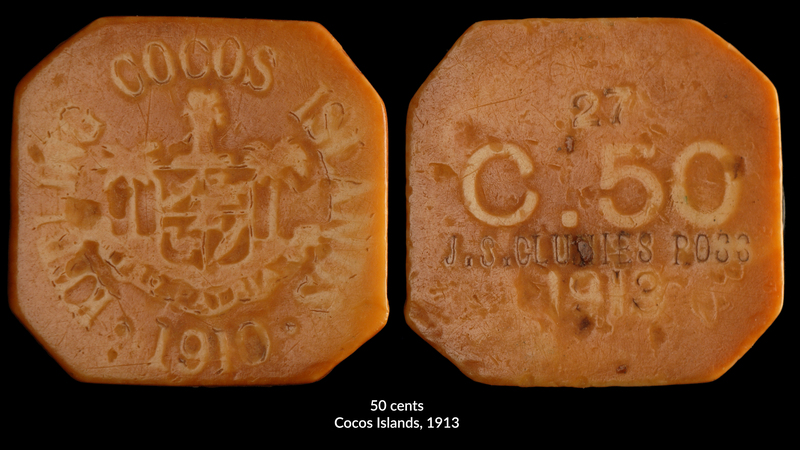 The ANA Money Museum is fortunate to possess a complete set of rare tokens of the Cocos Islands. 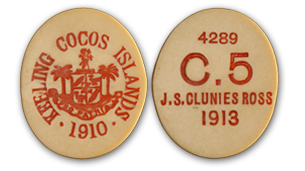 Produced in 1913, these tokens highlight the complex history of the islands and illustrate the economic control the issuing authority intended to create with their use. The Territory of the Cocos (Keeling) Islands, commonly known as the Cocos Islands, consists of 27 coral islands and two atolls discovered by Captain William Keeling of the British East India Company in 1609 during a voyage to discover spices. Located in the Indian Ocean approximately half way between Australia and Sri Lanka, the islands are now an Australian territory. 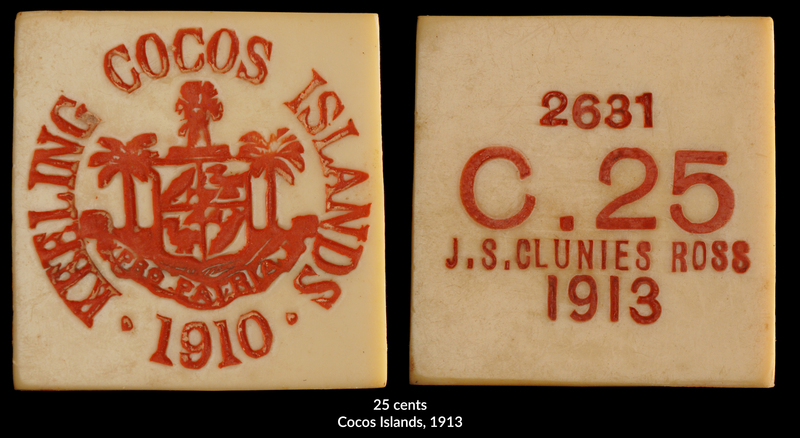 The name “Cocos” comes from a genus of the coconut palm found abundantly throughout the islands. The first permanent settler to arrive on the uninhabited islands was Alexander Hare, a wealthy adventurer who settled on Direction Island with a group of Malay women in 1826. In 1827 Scottish trader and sea captain John Clunies-Ross (1786-1854, regnal name Ross I) settled on Home Island with his wife, six children, mother-in-law and 10 young men. 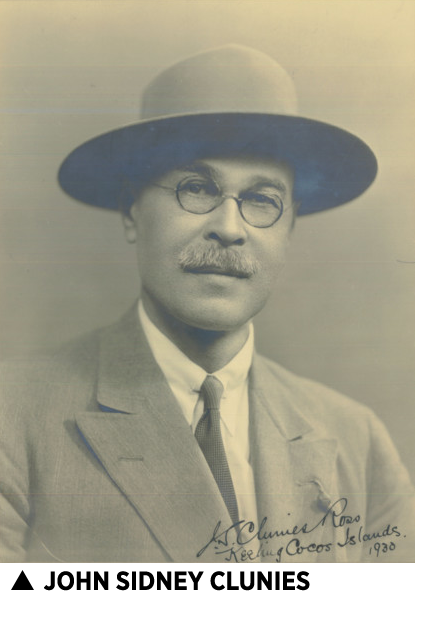 Additional men were imported from Java to work on Clunies-Ross’ plantation. Hare eventually left, leaving Ross I in possession of the islands. In 1836 the HMS Beagle visited the islands carrying a young naturalist named Charles Darwin; his research on atolls while there greatly affected his later work. 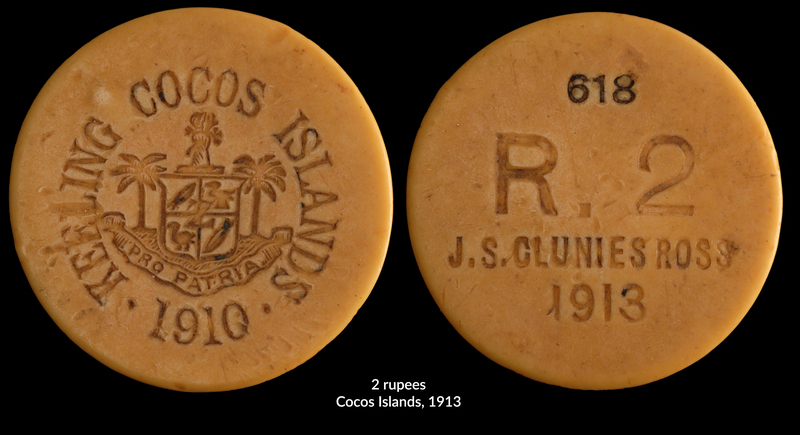 Between 1831 and 1857, the Cocos Islands were a private fiefdom ruled by the Clunies-Ross family. The family had complete control with no written laws or political parties, but maintained close ties with England. The islands were populated by about 30 Europeans and 170 people from the East Indies and the Cape of Good Hope. 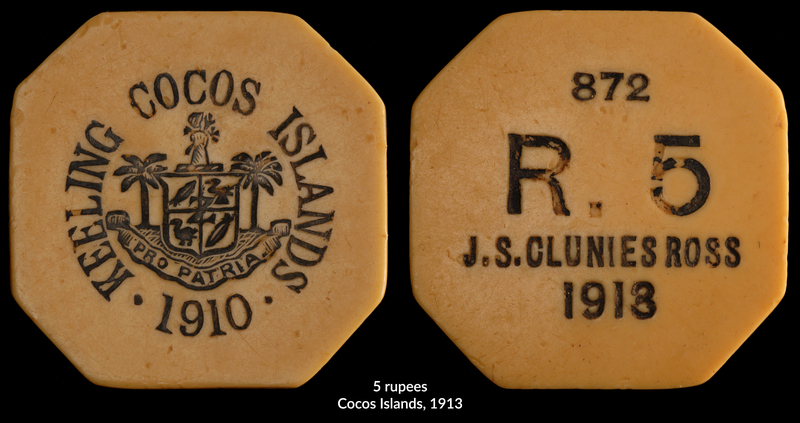 All non-Europeans worked at the plantation and were paid with “Cocos Rupees” that could only be redeemed at the Clunies-Ross family store. In 1854 John Clunies-Ross died and control was passed to his son John George (1823-1871, Ross II). 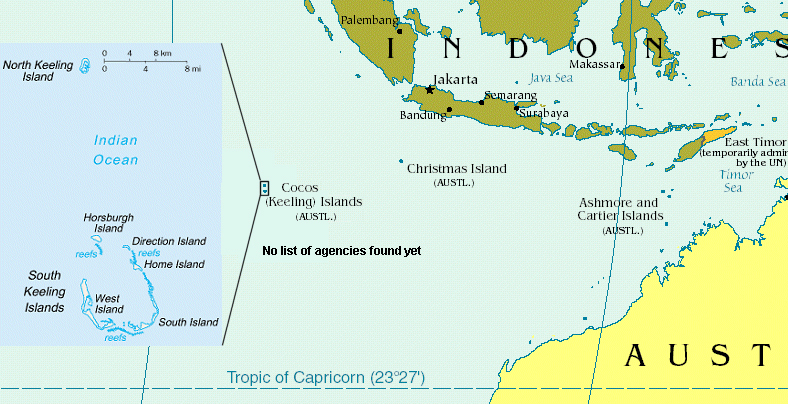 The Cocos Islands became a British protectorate in 1857 due to a navigational error. 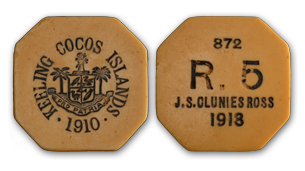 In 1886 Queen Victoria granted control to the Clunies-Ross family, who had proclaimed their islands a kingdom with themselves as monarchs (this title was not recognized by Britain or Australia). The population of the islands settled at around 500, mostly Malays employed in the Clunies-Ross business. 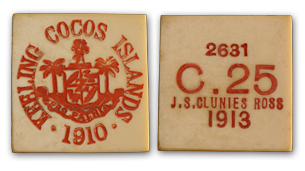 A cable communications station on Direction Island made the Cocos Islands an important strategic location in both world wars. 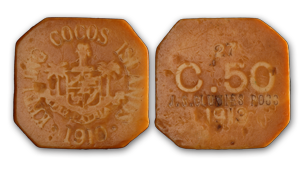 The Battle of Cocos in 1914 was one of World War I’s first naval encounters, and Great Britain stationed a garrison there during World War II. 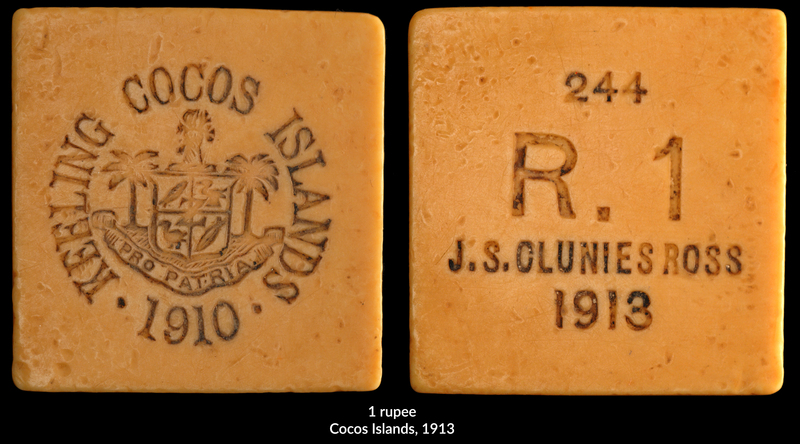 In 1903 the islands were annexed to the British colony of the Straits Settlements and incorporated into the colony of Singapore, remaining so until 1955 at which time Cocos citizens were given a choice of how to be governed and decided overwhelmingly to become an overseas territory of Australia. In 1978, under increasing pressure, Ross V relinquished his title. 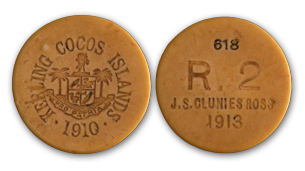 In 1910 John Sidney Clunies-Ross (Ross IV, 1868-1944) became Governor (or “King”) and in 1913 he issued a famous series of tokens. They were produced in seven denominations: 5 rupees (1,000 produced), 2 rupees (1,000), 1 rupee (2,000), 50 cents (2,000), 25 cents (5,000), 10 cents (5,000) and 5 cents (5,000). 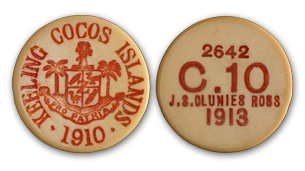 The tokens were made from “plastic ivory” or “ivorine,” and manufactured in England by a buttonmaker. 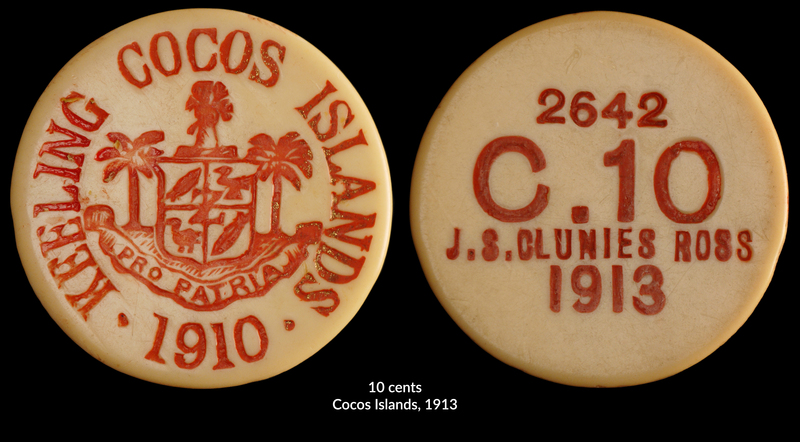 Each denomination’s obverse features the arms of the island with KEELING COCOS ISLANDS around, PRO PATRIA (for the fatherland) below and 1910 – the year Ross IV gained power. Each reverse includes the denomination, a serial number, the authorizing inscription J. S. CLUNIES ROSS, and 1913 – the year of issue. The tokens were a variety of shapes including circles, ovals, squares and octagons. 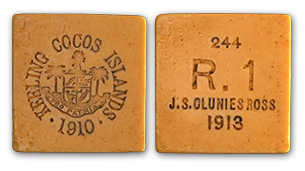 These unusual shapes and material served a purpose: Ross IV followed in his great-grandfather’s footsteps to create a closed economic system which prevented the islanders who worked at his plantation and store from buying firearms, alcohol or other goods from passing ships. 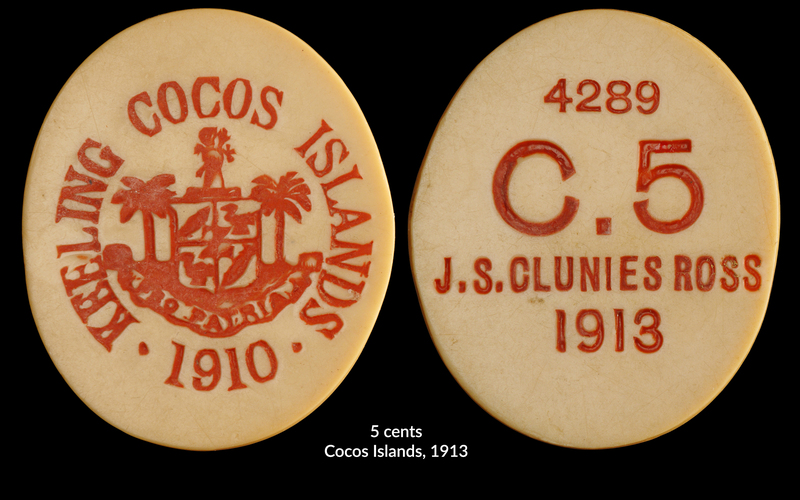 The tokens continued in circulation until 1955, when the Cocos Islands became an Australian territory. Excellent very well done. Today I learned about coinage history and geography. Now you can't beat all that in a blog. Thank you very much for your time and the picture. Mike. I like these. I recall reading abt them in Coins magazine, but I never owned any. Great collection and unusual. Interesting. i learned something new here. Wow! I think I will pack a bag and call my travel agent. I'm ready for a vacation. Highly informative blog. great photos. Thanks!